The last couple months of 2015 passed by in a blur! Between finishing up the semester, finals, holidays, and getting engaged (hooray! ), I finally have a chance to write about my final two races of the year. This time of year, October through December, I like to run festive races where I can dress up like whichever holiday is coming up and just have a good time running. November brings us the Thanksgiving season and with that comes the Turkey Trot races. Since I would be spending Thanksgiving with my now-fiance's family, I found a race in their town. It actually worked out really well as his brother called to see if we wanted to run that very same race with them. 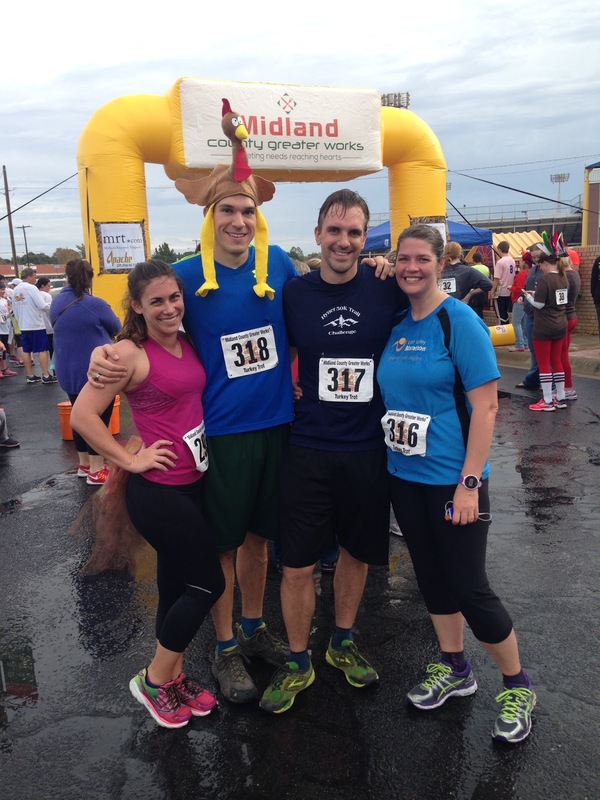 Bright and early Thanksgiving morning, we rolled out of our warm beds to venture out into the chilly, rainy outdoors for the Midland Turkey Trot 10K. Alex was totally awesome and wore a turkey hat, while I sported my homemade turkey tail bustle tutu. Alex's brother and sister-in-law met us at the race, and away we ran. Although the rain had stopped, the roads were slick, wet, and full of puddles. We found ourselves jumping over puddles, veering way off the road to avoid puddles, and then finally succumbing and just running through the puddles. Residents of the homes along the course cheered us on, especially Alex in his turkey hat. And Alex ran by my side every step of the 6.2 miles, even though he could've just gone on ahead at any time. We crossed the finish line together, and we both ran the entire distance. At the finish line, there was the normal fruit and Gatorade selections, but also hot chocolate, breakfast burritos, and a smorgasbord of vendors passing out all sorts of free food. I wasn't expecting this at all and it was AWESOME! We were famished after skipping my usual pre-run fueling meal, and I just couldn't wait for Thanksgiving dinner. I tip my hat to you, Midland Turkey Trot race planner! 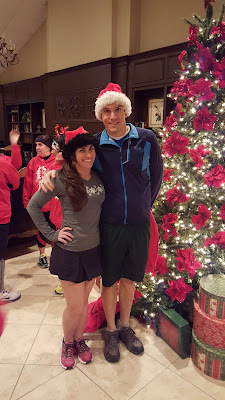 This race, the Jingle Bell Run, was a perfect way to start off the Christmas season. First of all, this race is untimed so there was no pressure to PR or compete. This lack-of-timing also allowed us to really enjoy the 4-mile course, which wound through the beautifully lit and decorated houses of the Colonial Homes. With the race starting at 6 in the evening, the lights were all turned on; it was like running through a light display. I quickly checked my weather app, but not well enough. I completely missed the fact that a cold front was moving in precisely at 6pm. So, I showed up to the race in a short running skirt. Sure, I looked cute, but I would've frozen if it hadn't been for Alex's awesome mom in lending me her workout capris. She saved my life! 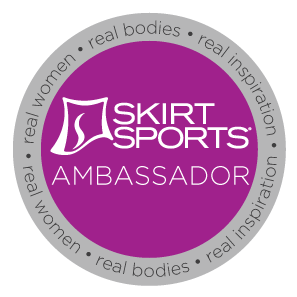 Still, I love my Skirt Sports Jette Skirt. It's pockets were big enough to hold my phone so I could blast Christmas music through the speaker. And I absolutely love my limited edition Skirt Sports long sleeve. I'm a sucker for thumb holes on my long sleeve shirts. This race passed out hoodies to all the runners, which was a great change of pace from the t-shirts that runners usually receive. 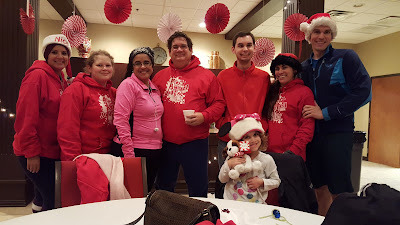 There were delicious Christmas cookies passed out before and after the race, hot chocolate, and prize drawings. My daughter even won a stuffed animal from the drawing, just for waiting for the running members of our family. Lone Star Runner's Club did a great job with this race. It was well organized, well planned, well stocked with refreshments, and festive. They even had musical performances scattered throughout the race course. They were high school students from the band or choir, singing and playing Christmas carols. I can think of no better way to view Christmas lights than by running by them while enjoying the talents of Christmas carolers.